He was born in 1946 in Chen Jiagou Village, Henan province, where T’ai Chi was created by his ancestor Chen Wang Ting 10 generations ago. He is the grandson of Chen Fake, renowned to be the greatest T’ai Chi master at the beginning of this century. His Shifu’s Chen Zhao Pi and Chen Zhao Ku were the main influence in his training as a child. He has been trained and inspired since before schooling age to master and carry on the family art. To prove himself worthy of his famous ancestors and to be the standard bearer of the Original T’ai Chi, he competed and won the title of All-China Grand Champion 3 times in 1980, 82 & 83, and was also crowned Grand Champion at the first Open International Tournament in Xian in 1985. He was the National Coach of China, and Martial Arts Director of Henan Province, which include the famous Shaolin Temple. 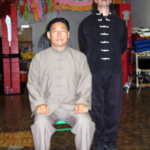 Grand Master Chen has a strong sense of responsibility to spread the art of T’ai Chi in its traditional and undiluted form, and he is now passing on this knowledge to those who have the dedication to learn the true principles of the art. He embodies the qualities of a true T’ai Chi master and has inspired and motivated the experienced and beginners alike. Chen Xiao Wang gives seminars all around the world, and regularly visits Hereford, giving people in the area the opportunity to benefit from his teaching and his wisdom. Grand Master Chen Xiao Wang is both the heir and head of the original style of Chen Taiji Quan, being the 19th generation successor to the oldest school in the world. He is one of the current top masters in the world today. He is one of the 4 Tigers from the Chenjiagou Village right now. From a very young age his ancestors and grandfather Chen Fake, who is considered to have been the greatest Taiji Master inspired him. He undertook a rigorous training discipline to master and be the standard bearer of the family art. He subsequently won China’s National Tournament three times consecutively, in 1980, ’81 and ’82. He was crowned All China Grand Champion at the first International Open Tournament in Xian in 1985. He is a member of the National Umpiring Commission and is technical advisor to the National Federation of Taiji Quan since 1985. He is also the national coach of China since his appointment in 1988. He has trained over thousands of students, many of whom have won at national and international levels. workshops at the Shaolin Temple teaching Chenjiagou Village Style.